In late 2014, I engaged in one of the most exciting projects of my life―helping control hogs on property owned by Morgan and Deven Michael in Orange County. The following are my notes from this truly unique adventure. After catching some hogs in traps with my friend Don Hubbard, I got a Titan Extreme TenPoint crossbow and started hunting them at night. The first night, I could hear a boar coming through brush very slowly. A slight breeze came from the wrong direction, and he was only about 30 yards away. Away he went. The next night I set up on the up-wind side in a one-chair, pop-up, ground blind. As I sat there in this not-too-safe-feeling blind, I heard him coming down the same cow trail I was sitting on. He stopped about six feet even with my blind, behind some brush. He was so close, I could hear him breathing. My scent killer must have been working overtime, yet he evaded me again. The author admires a boar that he bagged on a night crossbow hunt. A couple nights later, I was back up in the tripod stand. It was a windless night but started getting a light fog. He came back usual time. I could smell the old sour mud he had been rolling in and hear a light sound in the wet saw grass. He was here but very nervous he wanted the corn but did not come into the light. I came out the next evening and found the hog I had been hunting in the trap we set. It weighed 251 pounds. Next up big boar number 2 with much longer tusks. In fact, some local younger gentlemen thought they wanted to catch this hog. I mentioned they might not want to do that. He killed one dog and badly injured another. This one will stick his head in at this trap to but will not go in. I fixed a soft green light set up at this feeder and bought a Wicked green light to put on my TenPoint Crossbow. The hunt went on for several nights with the tusker only coming when the wind blows in his favor. Finally, he appears when I about to give up but he stays in the shadows most of the time darting in and out to get a bite of corn. At least he gives me a full broadside shot. I watch the Lumenok hit behind his shoulder but he drops the bolt about 20 feet in front of my tripod . The bolt was not very bloody so I figured he survived. Three nights later, he came in on the shadowy side next to the trap and begins to feed in front of it. I turned on green light and as soon as the green light touches him, all I see is the rear end of that boar in overdrive going though the tallow thicket. I did not think green lights bother hogs and it did not with other but this one was freaked out. I ordered a red light bulb for my Wicked light and arrive that evening right at dark to set up. About 8 p.m. I make sure my light and scope are set right. Red light looks great. As I am shinning the light around I look down road and there is a big pig coming. I fix the red light on him but something not right for him. He crosses over to the feeder and goes behind it a clump of trees and looks back my way. He starts to come back around feeder and cross the road to where I have a coyote live trap. He eats a little corn then goes into brush. A few minutes later, I catch something moving by coyote trap but on my side of trap as I swing the red light to him and as red light touches his face, he backs up into the pine trees. At this point I glad I am trapping hogs I at least have meat in freezer. I figure this hunt is over for tonight and just as I turn my red light off something moves to the left. This hog has made a complete circle, went by my parked truck down the road behind me came out to the left of me headed back to the feeder like everything was OK. He moves to about 20 yards, offering a perfect quartering shot. I watch red glow of the Lumenok hit right behind the shoulder & disappear . He ran to my right into a thick of blackberry and pine trees. It did not sound like he ran very far . This clump was about 1/8 acre in size so I waited awhile and started circling this patch looking for signs. The beast ran about 30 yd and piled up with a perfect heart shot. Only about three inches of my bolt was left in him with the rest out the other shoulder. This was an accommodating boar as he ran within 20 yards of my truck. I called Morgan & his son JT they help me load this 211 pound trophy boar loaded up. He is not biggest boar on the ranch. Game cameras are already showing some bigger boars taking their place. I look forward to continue the trapping efforts and attempting to kill more big boars with a crossbow. 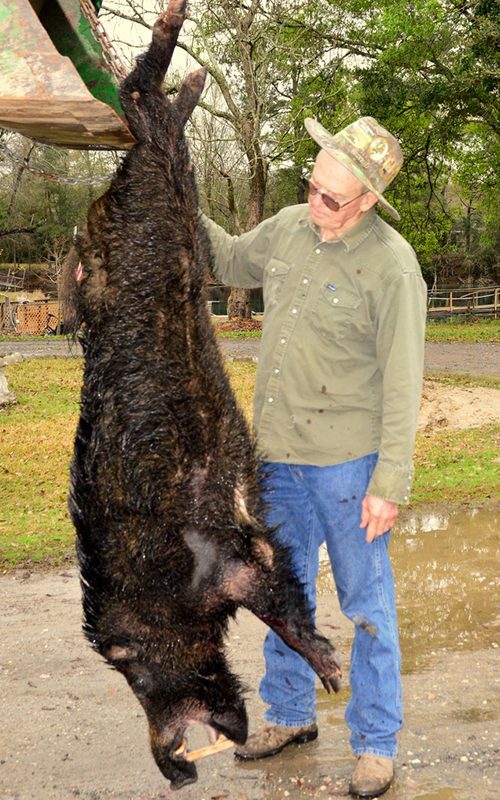 Anyone who thinks hunting hogs is not a challenge should try to specifically hunt a mature boar. It will quickly change your mind.